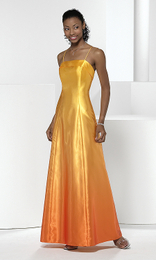 Description: A bias band accents the neckline of this spaghetti strap "Printed Ombre Satin" A-line gown. Colors: Black, Cobalt, Forest Green, Ice Yellow, Lilac, Navy, Petal Pink, Sky, Sunset, Violet Accessories: Includes self crinoline. Can be worn strapless.